Flight 3597 departed Berlin-Tegel at 21:01 from runway 26L for a flight to Zürich. The Avro climbed to a cruising altitude of FL270. At 21:40 the crew were cleared to descend to FL240 and two minutes later further down to FL160. At that time the crew were carrying out an approach briefing for a runway 14 ILS approach at Zürich. Having been further cleared down to FL130, the crew were told to prepare for a runway 28 VOR/DME approach. Another approach briefing was carried out and the minimum descent altitude was found to be 2390 feet AMSL. At 21:58 the aircraft was cleared for the runway 28 approach. At 22:03 the aircraft was descending to 4000 feet after which it turned right for the final approach to runway 28. At 22:04 a preceding aircraft reported having the runway in sight at 2.2DME. At about 22:05 the captain reported reaching the minimum descent altitude and said that he could see the ground. A little later the radio altimeter reported 500 feet agl, followed by a "minimum" warning. The captain then ordered a go around, but this was too late. The aircraft struck trees and crashed. The treetops were at 1784 feet AMSL. On October 18, a treaty was signed between Switzerland and Germany a.o. regarding the use of German airspace for Zurich approaches at certain times of the day. After 10 p.m., incoming aircraft had to approach Zurich from the east to land on runway 28. While the other runways have ILS equipment, runway 28 only allows VOR/DME approaches. Over a two week period (9-22 November) 108 approaches were carried out on runway - 2,3% of the total number of landings for that period. - Der Kommandant unterschritt die Mindesthöhe für den Anflug (minimum descent altitude – MDA) des standard VOR/DME approach 28, ohne über Sichtkontakt zur Anflugbefeuerung bzw. zur Piste zu verfügen. - Der Copilot unternahm keinen Versuch, die Weiterführung des Fluges unter die minimum descent altitude zu verhindern. - Im Anflugsektor der Piste 28 des Flughafens Zürich war kein System vorhanden, welches bei Unterschreitung einer Sicherheitsmindesthöhe einen Alarm auslöst (minimum safe altitude warning – MSAW). - Die Verantwortlichen des Flugbetriebsunternehmens haben über lange Zeit die fliegerische Leistung des Kommandanten nicht zutreffend bewertet. Dort wo Schwächen erkennbar waren, ergriffen sie keine zweckmässigen Massnahmen. - Das Konzentrations- und Entscheidungsvermögen des Kommandanten sowie seine Fähigkeit zur Analyse komplexer Vorgänge waren aufgrund von Übermüdung beeinträchtigt. - Die Aufgabenverteilung der Flugbesatzung während des Anfluges war nicht zweckmässig und entsprach nicht den Verfahrensvorgaben des Flugbetriebsunternehmens. - Der Höhenzug, den das Flugzeug berührte, war auf der Anflugkarte, welche die Flugbesatzung verwendet hatte, nicht eingetragen. - Die auf dem Flughafen ermittelte meteorologische Sicht war für den Anflug auf Piste 28 nicht repräsentativ, weil sie nicht der tatsächlichen Flugsicht im Anflugsektor entsprach. - Die zum Unfallzeitpunkt gültigen Sichtminima, um den standard VOR/DME approach 28 in Betrieb zu nehmen, waren unzweckmässig. The FOCA should check the extent to which a visual descent point (VDP) should be added to the approach charts for non-precision approaches. The Federal Office for Civil Aviation should check the extent to which the valid minimum visual ranges for non-precision approaches should be adapted, so that a final approach with the necessary visual references is possible from the visual descent point. The Federal Office for Civil Aviation should check whether the terrain profile along the approach path should be entered in the approach charts for all categories of instrument approach. The Federal Office for Civil Aviation, together with the operator, should check how a complete check on total flying duty time and rest time can be guaranteed. 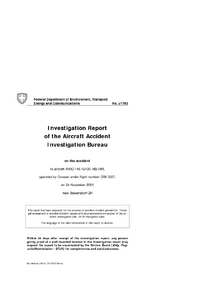 Within the framework of the quality systems required according to the provisions of the Joint Aviation Authorities (JAA) JAR-OPS 1.035 on the commercial carriage of persons and goods in aircraft, the Federal Office for Civil Aviation should demand procedures from the operators which indicate and eliminate deficits in the behaviour and working practices of flight crews by means of internal company measures and should monitor these procedures. The Federal Office for Civil Aviation should arrange for qualifications and proficiency checks to be administered, at least on a random sample basis, by inspectors or independent experts from the Federal Office. Distance from Berlin-Tegel Airport to Zürich-Kloten Airport as the crow flies is 655 km (409 miles).